For three centuries new families have settled in the Waterbury region: from a colony of farmers they became builders of a nation. The exhibit is dedicated to the people and the industries that brought notoriety to Waterbury and the Naugatuck Valley. The exhibit provides insight into Waterbury’s history explaining the distinctive role of brass in the city’s past. Learn how Waterbury, which was built on English tradition, transformed its struggling agricultural economy into a successful industrial center. It was the metal button that led to brass making, the industry that forged a brass empire that reached around the world. This exhibit includes hands-on activities designed to entertain while educating. Build a village and decide where to place your home, mill, church and shop on Waterbury’s rugged but swampy terrain. Watch Waterbury change from a farming community to an industrial city to a modern city divided by highways. Work the production line and realize the stress of making a button in 30 seconds. Listen to the voices of people from the region describing their experiences including coming to Waterbury, living in the neighborhoods and finding work. Coming Home chronicles the local history of Waterbury and the Naugatuck Valley. As you read and hear the stories of our region you will learn that its greatness is the result of countless individuals, from those who uprooted from Farmington and settled in the valley to those who emigrated from other countries. Men of Letters: Presidential Signatures is also on view in the Orton P. Camp, Jr. History Exhibit and features some special pieces of American history – the signatures of every US president from George Washington to George W. Bush. Official documents, photographs and personal correspondences make up this collection, offering a unique perspective of the story of the United States. This one-of-a-kind collection was donated to the Mattatuck by Fay Vincent, Jr., Waterbury native and former commissioner of Major League Baseball, in honor of his parents Alice Lynch Vincent and Francis T. “Fay” Vincent, Sr. Items range from a passport signed by both George Washington and Thomas Jefferson, to a military appointment signed by Abraham Lincoln, to a Christmas card sent by George H.W. and Barbara Bush with a photo of their children including “Georgie” and “Jebby”. This significant collection adds to the Museum’s history gallery and offers numerous learning opportunities for school tours, families and adults. Fortune was an 18th century African American man who was enslaved in the Waterbury household of Dr. Preserved Porter. With the aid of new technology this exhibit reveals the complex stories of Fortune, his family, the Porter family, and the story of slavery in Waterbury. 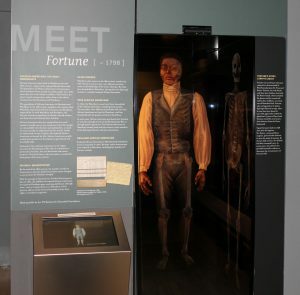 An interactive kiosk includes short videos of Fortune’s skeleton being examined by anthropologists. For more of Fortune’s story, click here.